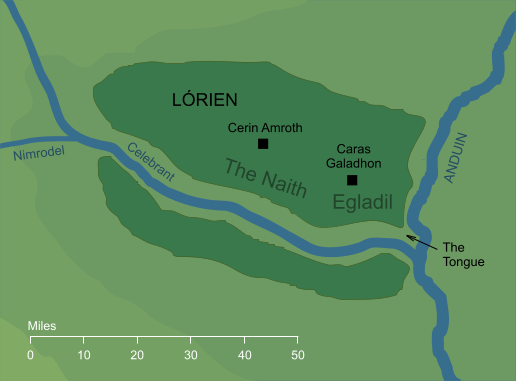 Note that the exact locations of Cerin Amroth and Caras Galadhon are not known. The positions shown on this map are speculations based on the text of The Lord of the Rings. A woodland kingdom of the Silvan Elves on the western banks of the River Anduin; Galadriel and Celeborn came there in the Third Age, and ruled it after the loss of its ancient lord, Amroth. That is, the people of Lórien were of Silvan origin. They were ruled in the later Third Age by Galadriel and Celeborn, neither of whom were Silvan Elves. Galadriel was of the Noldor, and Celeborn, at least according to the published Silmarillion, was of the Sindar. This is the literal meaning, almost certainly in reference to the golden Mallorn trees that grew in Lórien. The form of the name, though, is almost certainly influenced by the older names of the land, and (especially) by Lórien in Valinor, which Galadriel would certainly have known, and probably visited. This version of the name, though, derives from (o)lor-, 'dream' rather than (g)lor- 'gold', and this connection with dreams is also sometimes made regarding Lórien in Middle-earth. Original content © copyright Mark Fisher 1999, 2000, 2004. All rights reserved. For conditions of reuse, see the Site FAQ.